Hi Ryan - there's not one on the Modano website but we could mock something up for you pretty quickly. I've always done these with a VBA macro - i.e. cash sweep/payback period analysis. Is this what you're expecting? Also, what time series are you using - e.g. annual, monthly, annual historical & forecast, etc? My model is monthly. That's exactly what I'm working on, cash sweep to either draw down or repay revolver using a cash flow waterfall. This business is seasonal so working capital levels fluctuate quite a bit leading to revolver drawdowns. Ok Ryan - I've built a cash sweep (i.e. revolving debt facilities functionality) into the debt module within a monthly forecast-only financial model and attached it to this comment. Specify funds available for each facility, which limits the funds drawn from each facility to this amount in each period if funding is required to meet a closing cash target. Note that I haven't included more sophisticated things like fees on committed/undrawn funds, etc., as the focus of the example is the sweep method. Specify a ranking for each debt facility (or zero to have them ignored), thereby determining which facilities are included in the cash sweep, and the order of the facilities from which cash is drawn or repaid in each period. 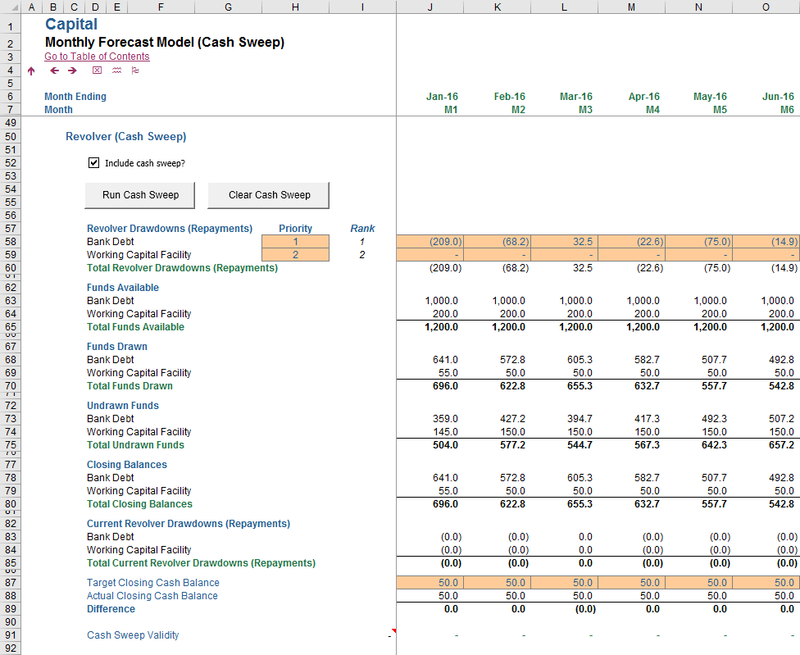 Specify the target closing cash balance in each period. To apply all cash to debt repayment (i.e. run a payback period analysis), enter zero in all periods. Switch the cash sweep on and off. It does not allow for multiple debt facilities (i.e. one for bullet, one for credit foncier, etc.). I would use a separate Cash Sweep module to handle this, and it would require some smart linking to ensure that debt facilities can be added and removed from each debt module without the Cash Sweep module breaking. I'll have a crack at this next time. Let me know if this is what you were after, or if I've missed anything. Copy the VBA module named 'mCashSweep' from my example workbook into the VBA project within your modular workbook.